The John Fritz Medal is awarded by the American Association of Engineering Societies, and is considered "the highest award in the engineering profession". In April, Kristina M Johnson, Ph.D. became it first woman recipient. Johnson is being recognized for her internationally acknowledged expertise in optics, optoelectronic switching, and display technology and her commitment to education and the engineering profession. Johnson is currently the senior vice president for Academic Affairs at Johns Hopkins University. Prior to that position, Johnson was the Dean of the Edmund T. Pratt Jr. School of Engineering at Duke University where she implemented the importance of engineering education. During her tenure, the Pratt School experienced significant growth in both size and quality. The engineering faculty grew by 50%, women faculty in engineering tripled in number, and teaching and research facilities increased tremendously. In addition to her profound influence at Duke, Johnson co-founded the Colorado Advanced Technology Institute for Excellence in Optoelectronics and is director emeritus of the Optoelectronics Computing Systems Center at the University of Colorado. Johnson holds numerous patents and has authored over 140 referred journal publications. Johnson's reputation, however, has a habit of preceding her-at least since her senior year at Denver's Thomas Jefferson High School in 1975. That was the year she decided to map the growth of a fungus, using holography, for a science fair project. Chemistry had been her first love, but she had moved on to physics because, as she now recalls, "It was harder, so I thought I should try to become a physicist." Her project won the city contest, then the state, and ended up with a first and a second in the physics division at the International Science and Engineering Fair. "I figured there was something to this and that I should stick with it," she says. She was encouraged by her parents: her mother "always believed that education was the way forward" and her father who gave books on electricity, taught her how to build a telegraph set and "presented her with her first slide rule." She went on to receive her doctorate from Stanford, and after a postdoc at Trinity College in Dublin, returned to the US as an assistant professor in electrical engineering at the University of Colorado, Boulder. There she earned tenure in less than five years, worked on a television series for children about the physics of light, and helped found (and was appointed the deputy director of) the Engineering Research Center for Optical Computing Systems. 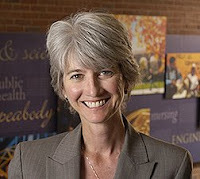 From 1999-2007 she was the dean of the Duke University Pratt School of Engineering. Currently she's provost and senior vice president for academic affairs at The Johns Hopkins University.